Our frequent moves continued into our civilian life. Our gypsy lifestyle has finally landed us in the northern prairies of Arizona. We share our rambling farmhouse with our son the farmer, his wife, my granddaughter and three dogs. Together, we’ve embraced an age-old lifestyle that has been mostly lost in the United States - multiple generations living under one roof, who share the workload, follow their individual dreams and reap the benefits of combined talents. Although I didn’t start out to write romance, I’ve found all good stories have to involve complicated human relationships. I’ve also learned, no matter a person’s age, a new discovery is right around every corner. Whether humorous or serious, straight contemporary or mystery, all my books revolve around those two facts. "The Morning After" by Brenda Whiteside is a sweet love-at-first-sight short story that will make you smile. Abigail and Bobby meet at their best friend’s wedding. Bobby falls in love with Abigail on the spot. Abigail is extremely drunk and doesn’t remember much of the wedding celebration. The next morning she awakes to find Bobby in her bed and has no idea who this handsome man is or how he got there. Abigail is surprised and amazed when Bobby tells her that they also got married the night before and that she is the love of his life. Abigail is attracted to the handsome Bobby Stockwell, but unsure about the whole marriage deal. They spend some time together and Abigail becomes more and more attracted to Bobby but not without some pitfalls and concerns. Bobby remains true to his feelings and his love for Abigail never falters. "The Morning After" is a very quick read that will leave you with a warm and fuzzy feeling. Brenda Whiteside has written a wonderful book for the romantic reader. I was hooked from the first page and stayed up late into the night to finish. "The Morning After" is ninety-eight pages of pure, cleanly presented love between two people that the reader cannot help but become emotionally attached to. Brenda Whiteside is truly a writer who knows how to please the reader. 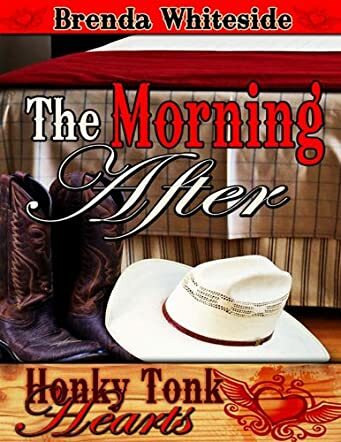 I highly recommend "The Morning After" to all women, young and old, who enjoy a good old-fashioned happy ending love-ever-after, make you feel good book.